Matthew Cromey, Principal Plant Pathologist, joined the RHS in 2014. He obtained his BSc (Hons) in Botany from Victoria University of Wellington and his PhD from the University of Canterbury in New Zealand and worked previously at the New Zealand Institute of Plant and Food Research. He is responsible for leading RHS research on plant diseases, developing collaborations with external organisations, and providing advice and technical information to members and the public. His research has spanned a wide variety of plant disease issues, focussing particularly on integrated management of soil-borne diseases and utilisation of disease resistance to foliar diseases. He has published more than 70 peer-reviewed articles and edited journals such as Australasian Plant Pathology. 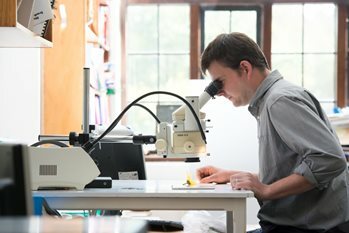 Current research projects include the development of integrated strategies to manage box blight (in collaboration with the National Trust), and research to improve the management of rust diseases of ornamental and vegetable Allium species through an understanding of hosts, pathogens and their interactions. Matthew is collaborating with other research organisations (ADAS and the University of Worcester) in a review of diseases caused by aerial oomycetes. He is also working with the Association of Applied Biologist Integrated Pest Management (IPM) and Biocontrol Working Group towards the application of IPM principles to gardens and the ornamental industry.